Is There A Continuum for Competency-Based Education? Transitioning to competency takes more than a declaration; it’s a strategic decision that requires precise movement along the continuum of competency-based education. 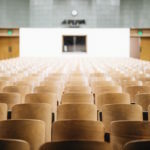 After attending a state meeting recently to discuss competency-based education with education leaders and consultants, I left with several thoughts about the breadth and depth of competency-based education. As states and colleges evolve in their adoption and implementation of competency-based education, some are finding it difficult to fully implement a strictly non-credit hour, direct assessment model. As such, a plan that provides a scaffold for both transitioning to competency-based practices and scaling the model beyond a small group should be considered. It is in that light that the following should be considered when scaling up and transitioning to competency-based education. 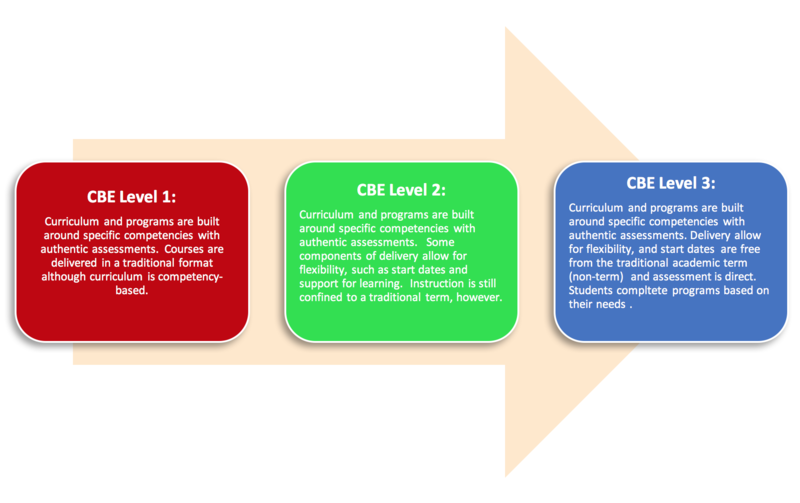 In short, CBE exists along a continuum with evolving adoption that ranges to classroom-based competency-based instructional practices to a fully developed program-level competency-based educational model that impacts instruction, delivery, services and policy. The credit hour should not stop the important conversation around competency-based education (CBE).There are many ways to deliver content in a competency-based pedagogical model. While CBE has the potential to offer content that is self-paced, individualized, accelerative, credit-free, and assessed authentically, CBE can also offer content that takes more time, is available for cohort groups, is based on the credit hour, and is assessed by standardized tests. Competency-based education is an instructional model that deconstructs learning in meaningful ways in order to identify demonstrable skills, and should not be defined solely by ways in which the content is delivered. The focus is on the learner and what the learner needs to be successful. There are ways competency-based and credit hour can live in the same space and still benefit students. At the crux of the conversation should be how competencies are developed. Developing competencies is a deep and intensive endeavor that depends on a critical understanding of what it means to be competent. 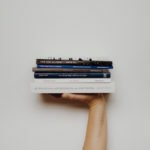 It is more than just adopting learner outcomes from a published textbook and it is more than organizing the content by topics depicted in a syllabus. It involves an authentic deconstruction of the content that transcends the artificial barriers we establish for convenience. How those barriers are established for reporting, transcribing, and aid should not take precedence over how the competencies are defined. Succinctly, the development of competencies in a studied and relevant manner is paramount and should be the most critical component. Developing competencies is a process, a skill. Determining what competencies to develop is a decision, and a decision that must be informed by the end user—business, industry and the job. 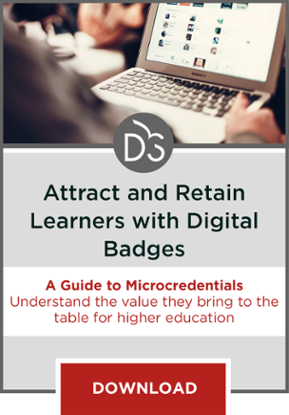 To get at the core competencies needed to be a learned individual and a competent worker, it means having conversations that matter beyond de facto advisory councils and beyond annual meetings of educators and employers. We must expect that before a curriculum is approved it has been vetted—closely—by the profession that is the ultimate recipient of the beneficiary of the curriculum (the student) and this is a rare event. Employers must engage in the development and definition of the competencies that matter and it must be a purposeful and intentional expectation. If educational institutions develop collaboratively agreed upon competencies for their graduates, then business and industry position announcements and job descriptions should reflect those competencies. Competencies in college should be benchmarked against what business and industry need, making it unnecessary to ascribe meaning to grades and courses that say nothing about what underlies those often arbitrary numbers and letters. Employers need to make decisions for employment. Those decisions are better informed if employers have access to competencies attained by the prospective employee that are matched directly to the job responsibilities and skills they are seeking. How can we bring skills to the fore that are now observable and operationalized? A new transcript. If a student exits with a transcript that is competency-based, the technology should exist to allow the competencies to be sorted and aligned with expectations and requirements of the job the student is seeking. When a student interviews for a job, they can research the job requirements, sort and select the competencies achieved during the acquisition of their degree, and take that information—documented competence in relevant areas—to the job interview. The conversation becomes a different conversation and the shift is made from exploration and discovery of the interviewee to confirmation and validation of readiness for the job. In a competency-based model, correlations exist between the delivery of the model and savings in cost, time and place. When students can move through the content at their own pace, money is saved as well as time to credential completion. These are the more obvious correlations. One interesting correlation that may not be as evident is between competency-based education and efficiency of learning. Because the content to be learned is organized in a manner that is performance-based, the student is more focused and the cognitive engagement is more deliberate. There is less time spent on extraneous material that does not add value to the learning outcome. In conclusion, colleges, universities or systems should not back away from competency-based education if they can’t immediately implement some of the hallmarks of CBE, such as freedom from the credit hour, authentic assessments or self-paced progression. Rather, a plan should be developed that allows for transitioning to the more impactful components of CBE.